The Boxtrolls is being released in 3-D, and I wish it were in Smell-o-vision, too. Its ornate world of piled-up garbage and giant wheels of cheese and gross body horror would surely emit a wondrous stink. Adapted by the animation studio Laika (who gave us the terrifying coming-of-age tale Coraline and the horror spoof ParaNorman) from Alan Snow’s novel Here Be Monsters!, this is a film firmly rooted in the dark side of a child’s imagination — the side that compulsively wonders what might happen if you smelled this or broke that, that occasionally threatens to experiment on the family pet. It’s a delinquent film, but it’s magical. 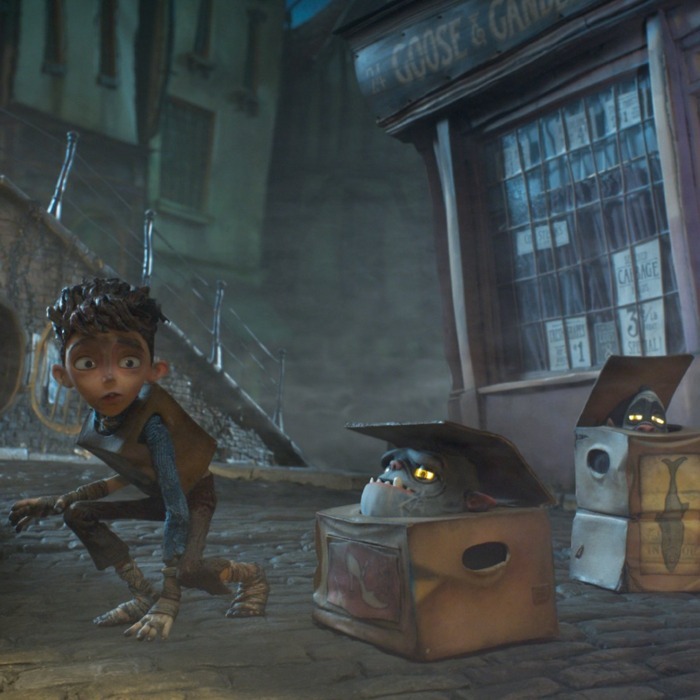 The film takes place in a town called Cheesebridge, a baroque little place obsessed with cheese and where the populace lives in fear of the Boxtrolls, mysterious little mutants who have a reputation for coming out at night and kidnapping children. Of course, the only thing these creatures actually do is scavenge the town’s garbage for little trinkets and gears that they can then use for their elaborate underground inventions; they’re a kindly, communal race of engineering savants. As if to illustrate their innocence and simplicity, the Boxtrolls wear discarded boxes; their names, like Fish, Fragile, and Shoe, reflect what’s written on those boxes. Among them, however, is a young human boy, Eggs (voiced by Isaac Hempstead-Wright), who was adopted by them as a baby — an event that may have been the impetus for the child-napping slander. Then a human girl named Winnie (Elle Fanning) enters their subterranean lair and discovers that the Boxtrolls are not in fact monsters out of our worst nightmares. They hatch a plan to try to teach the people of Cheesebridge that these creatures aren’t evil at all. Unfortunately, the town’s exterminator, Snatcher (Ben Kingsley), and his little gaggle of red-hatted troll hunters have other plans. For years, this vile little operator has been using the town’s fear of the trolls, and his expertise in catching them (or, as he puts it, “acquiring them”), as a way to insinuate himself into the halls of power. He wants nothing more than to trade in his red hat for a white one — which in Cheesebridge denotes authority, and, perhaps more important, class. If all that sounds curiously allegorical, that’s because I’m pretty sure it is. It’s also not particularly original — a heaping serving of popular children’s stories with a side of political resonance. But here, it’s the sick little frills that count. Laika has a talent for outlandish, macabre designs, and the baroque world of The Boxtrolls looks like a fever dream someone might have after watching a double feature of Nosferatu and Chitty Chitty Bang Bang. The narrative also unfolds at times like a nightmare, with beloved characters occasionally being offed in horrific ways — though (spoiler alert) they usually come back later, unharmed.